Email is makes from two word E And Mail, E stands for Electronic And mail is information, Matter or massage. We are calling Electronic Mail and in shorten and most popular in the IT field it called E-mail or simply called Email. Electronic mail or email is the transmission of messages over communications networks. The messages can be notes entered from the keyboard or electronic files stored on disk or enter by any electronic media. Mostly an email system having text editor for formatting the email text as per need. It has carry all the data in electronic format such as test, audio, video and files etc. E-mail is one of the protocols which included with the Transport Control Protocol/Internet Protocol (TCP/IP) suite of protocols. A popular protocol for sending e-mail is Simple Mail Transfer Protocol in shorten its called SMTP and a popular protocol for receiving it is POP3 (Post Office Protocol 3rd version). IMAP (Internet Message Access Protocol) – Is a standard protocol for accessing e-mail from your local server. IMAP is a client/server protocol in which e-mail is received and held for you by your Internet server. As this requires only a small data transfer this works well even over a slow connection such as a modem. Only if you request to read a specific email message will it be downloaded from the server. You can also create and manipulate folders or mailboxes on the server, delete messages etc. READ What is bandwidth? why is it important for purchasing any hosting plan? The POP3 Post Office Protocol Version 3 protocol uses for allowing you to retrieve mail from your ISP. Retrieve mail from an ISP and delete it on the server. Retrieve mail from an ISP but not delete it on the server. For Example if somebody sends you an email it usually cannot be delivered directly to your computer. The message has to be stored somewhere, though it has to be stored in a place where you can pick it up easily. Your ISP (Internet Service Provider) is online 24 hours on 7 days of the week and will do that job. It receives the message for you and keeps it at server until you download it. 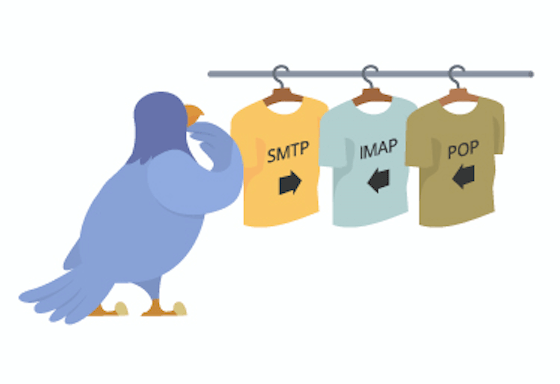 SMTP is a mail protocol of receiving email, The SMTP protocol can only be used to send emails, not to receive them. Depending on your network / ISP settings, you may only be able to use the SMTP protocol under certain conditions. The HTTP protocol is not a protocol dedicated for email communications, but it can be used for accessing your mailbox. Also called web based email, this protocol can be used to compose or retrieve emails from an your account. Hotmail is a good example of using HTTP as an email protocol. What is DHCP ? Why we are using DHCP?